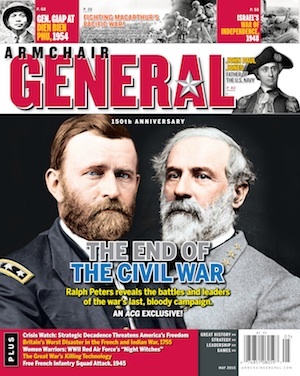 Vietnam | Armchair General Magazine - We Put YOU in Command! Home » Posts Tagged "Vietnam"
In 1966, the Advanced Research Projects Agency, cooperation with the U.S. Forest Service, developed a program designed to eliminate jungle cover for communist forces in South Vietnam by using air-dropped incendiaries to start forest fires. The second edition of 'Mark H. Walker's Lock 'n Load: Forgotten Heroes–Vietnam' updates a classic boardgame that is great for solitaire, 2-player or even multi-player games. Donald D. Blackburn formed a guerrilla force in the Philippines to harass the Japanese occupiers. Years later, he spearheaded Operation White Star in Laos and planned the Son Tay rescue mission. In 1945 British and Japanese troops that weeks earlier would have tried to kill each other joined forces to put down rebellions in Southeast Asia. "An Airman’s Story: Duty, Honor, Country The Legacy Lives On" is an independent, hour-long documentary focusing primarily on the American pilots who flew F105s and F4 Phantoms against the Communist MiGs during the Vietnam War.